I’m a little slow getting to organizing in the new year, but it recently hit me that 2 areas were driving me crazy and need some organizational attention. 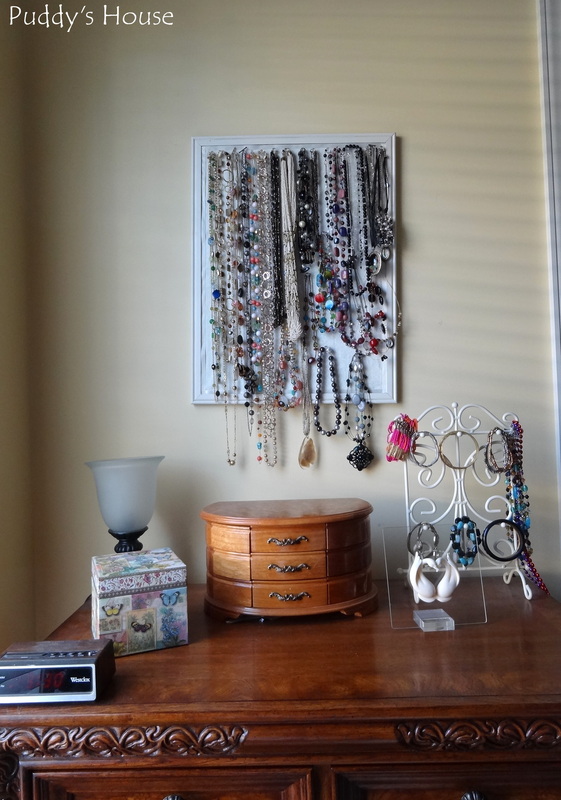 The first area was my night stand, which is where I was storing my jewelry. The second area was our closet. All of my necklaces were hanging on a cork board that I had covered in fabric and trimmed with ribbon. I had most of my bracelets on the wire rack on the night stand. I don’t know what its actually called, or even if it was the real purpose of the wire rack, because I bought it for a few dollars at the Goodwill. The rest of my nightstand is very functional….a little lamp, a small decorative box that holds my phone charger and accessories, and our old alarm clock. Our closet is a feature of our house that I love. 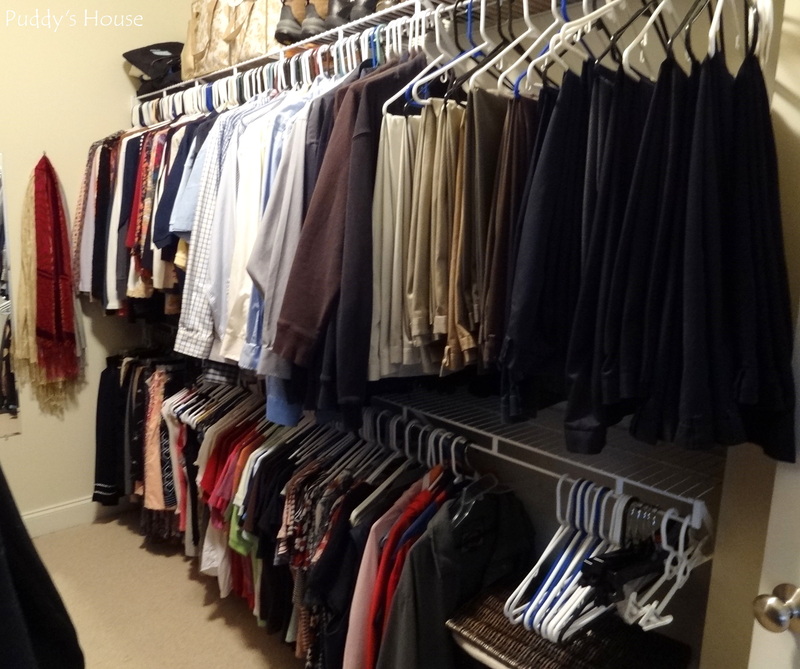 In my previous home, I always had to rotate clothes to other closets or storage areas based on season. I don’t have to do that in our home, as there is enough space for all my clothes and some room for Bob’s clothes too. The problem with that is that I don’t really have to purge. It all just fits. So, I have to really force myself to go through my clothes and get rid of ones that I don’t wear and/or don’t fit. But, as you can see just because there is room for everything, doesn’t mean it looks good, or it is very functional. So, it was definitely time to go through the closet and purge and organize. I had just gone through the closet over the summer, and it still felt too full. This time, I took a different approach. 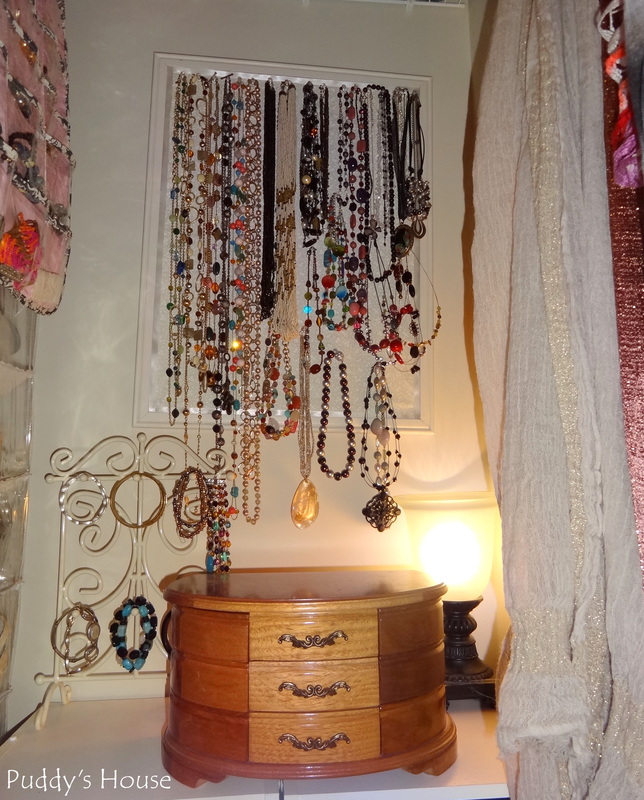 I made the goal of creating enough space in the closet that I could have a jewelry station within the closet. 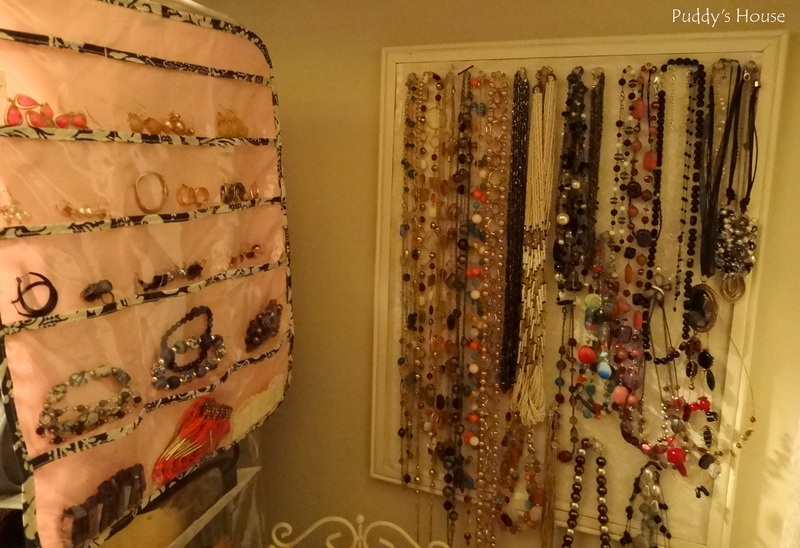 That way, my closet got organized and I got a new organized place for my jewelry. Bob was headed to Florida for several days on a guy/golf trip, so I decided that was the perfect time for me to reorganize. The reason for waiting until he was away, was because I knew it always gets worse before it gets better…. I did my best to work with what I had, but in the end I had to spend a little bit of money to get the level of organization I wanted. 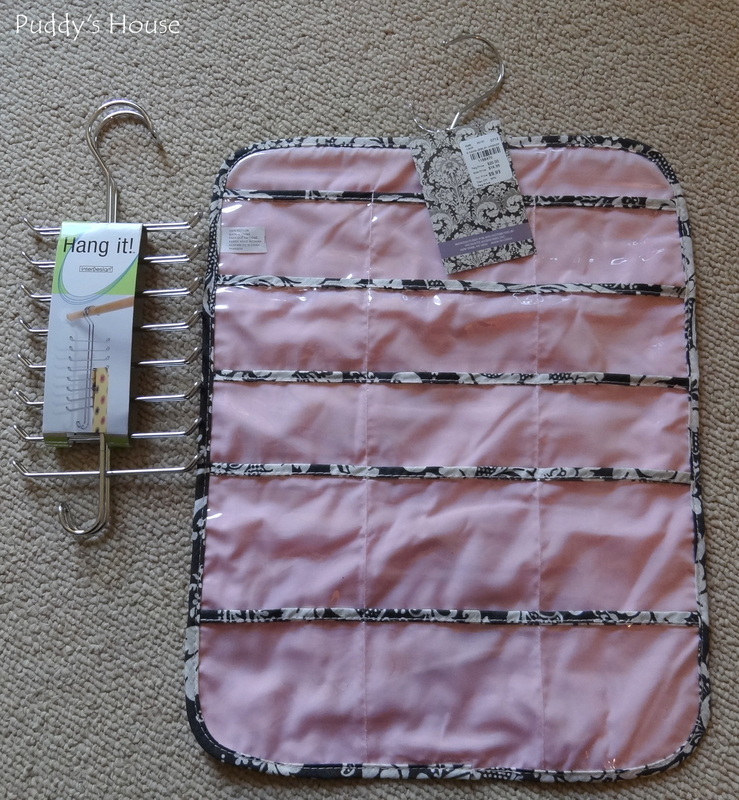 I bought a belt organizer ($6) and a hanging jewelry organizer ($10). 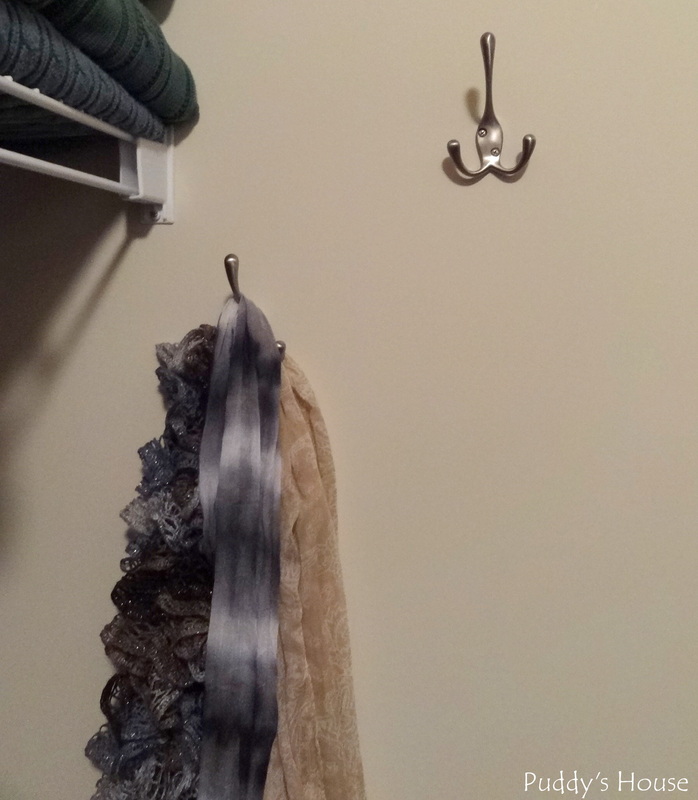 I also bought 3 hooks to install on the wall for my scarves. They were $3.97 each at Lowe’s. I was originally looking for something that had multiple hooks already assembled. But, when I saw them at the store, they weren’t cheap and I thought the scarves would get too tangled together, so I bought the individual hooks so that I could stagger them on the closet wall. After several hours of trying on clothes and making piles for trash, Goodwill, and sharing with my sister, I was done with the clothing portion of the organization. 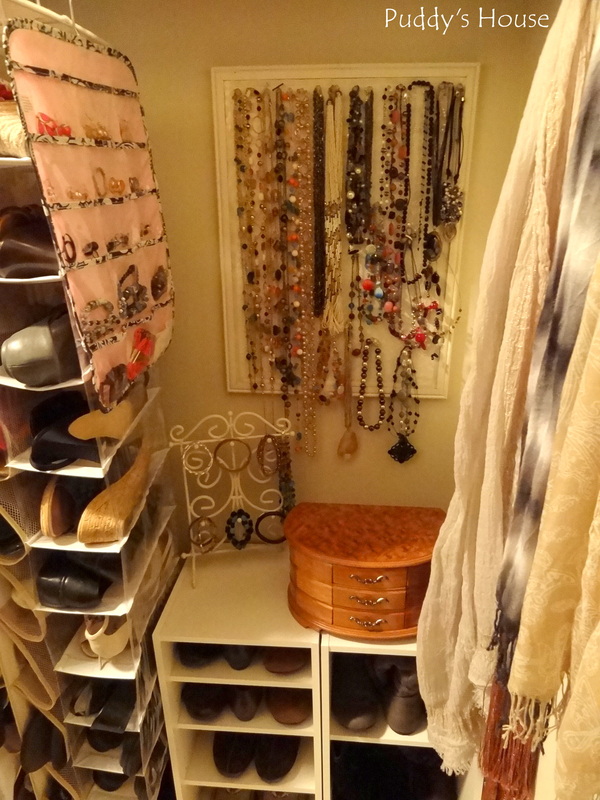 I had removed enough clothes to have an area for my jewelry in the back of the closet by the mirror. I hung the corkboard on the wall, and hung my new organizer right beside my hanging shoe organizer. I added light to the area using the lamp that was previously on my nightstand. The jewelry box and bracelet rack are sitting on top of 2 white shelves that were hidden in the closet before. They were storing random items. Now, they are used as additional shoe storage, which was accomplished by moving the adjustable shelves to make room for flats in the one shelf, and taller boots in the other shelf. 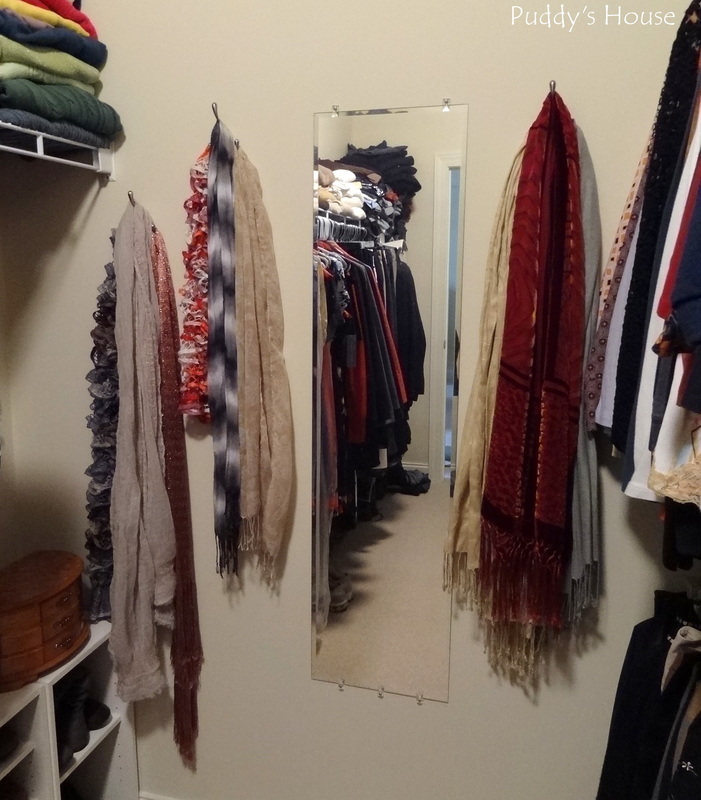 Now, my scarves are on display so that as I am picking out my outfits, I can easily add my accessories too. 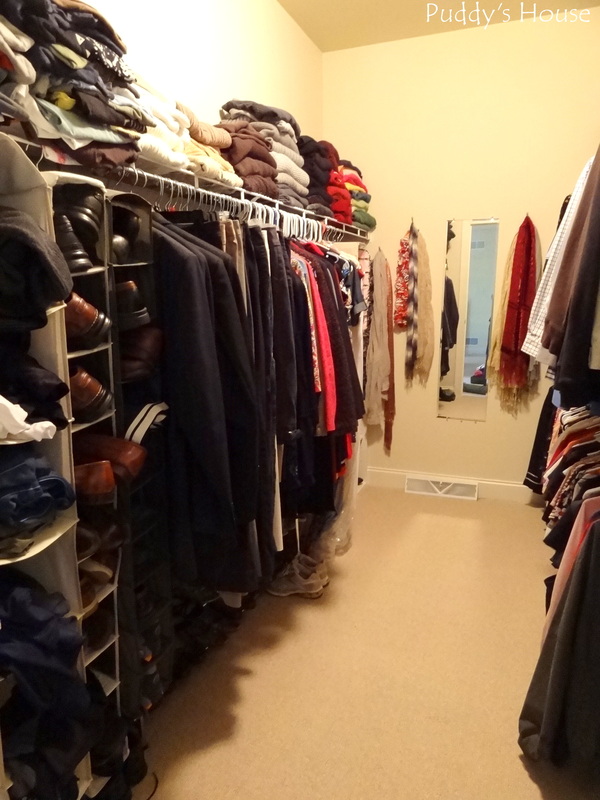 This is the most of the closet floor I’ve seen in a long time! 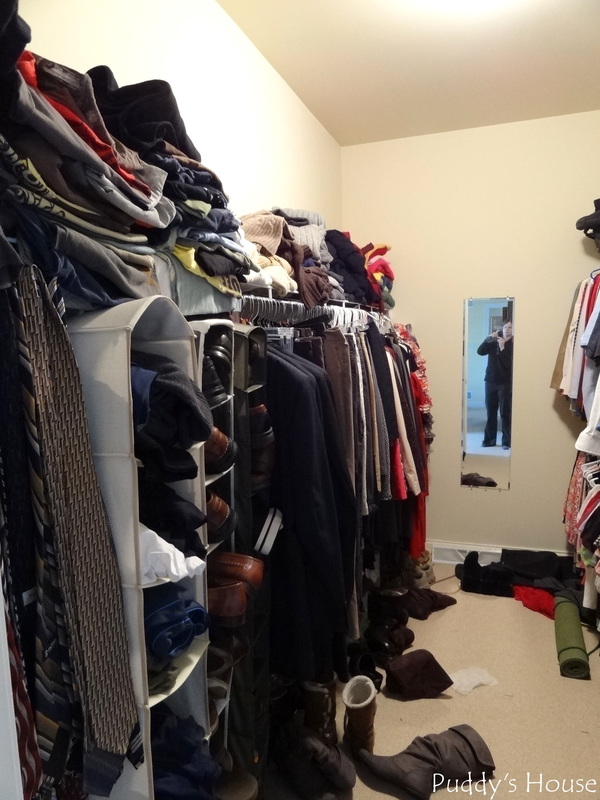 My clothes are separated by type: pants, suits, and dresses are on the left – sharing that side with Bob’s ties, shoes, t-shirts and suits. I have a shoe rack for my heels on the floor under my pants and suits. 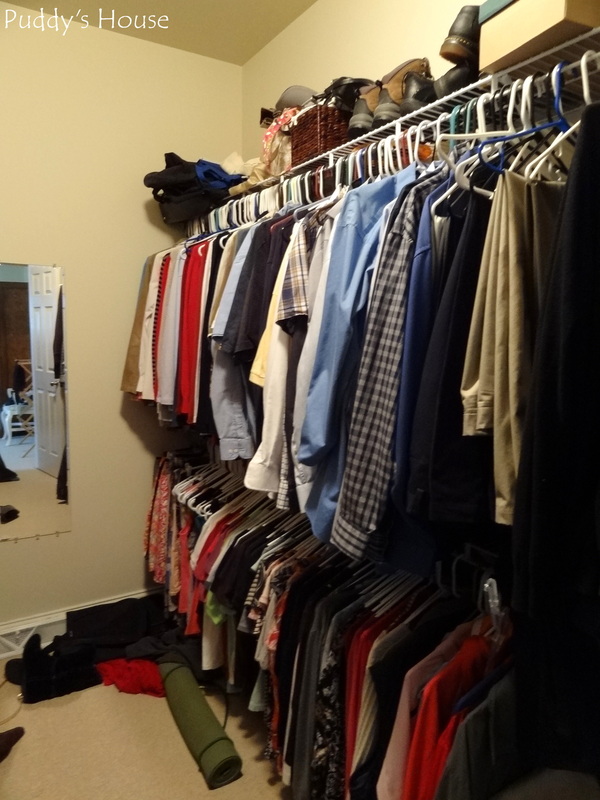 The right side of the closet has Bob’s pants and dress shirts, organized by color. Then my short sleeve, 3/4 length, and long sleeve shirts, as well as skirts. I feel so much better about the closet. It was well worth the time spent, and I think I made smart organization decisions so that it is something I can maintain. I’m still tweaking the changes to my nightstand, so I will share that once I get it finalized. Has anyone else spent the new year organizing? 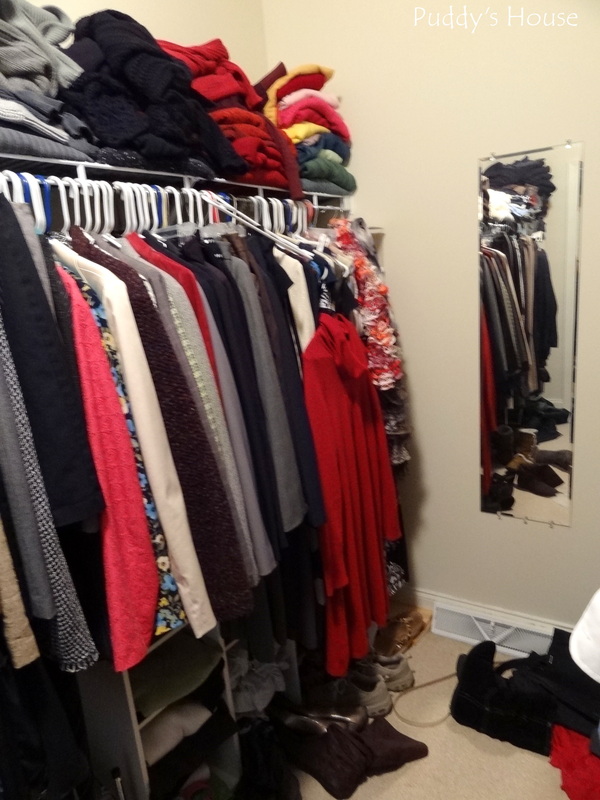 Do you organize your closet by clothing type and/or color? 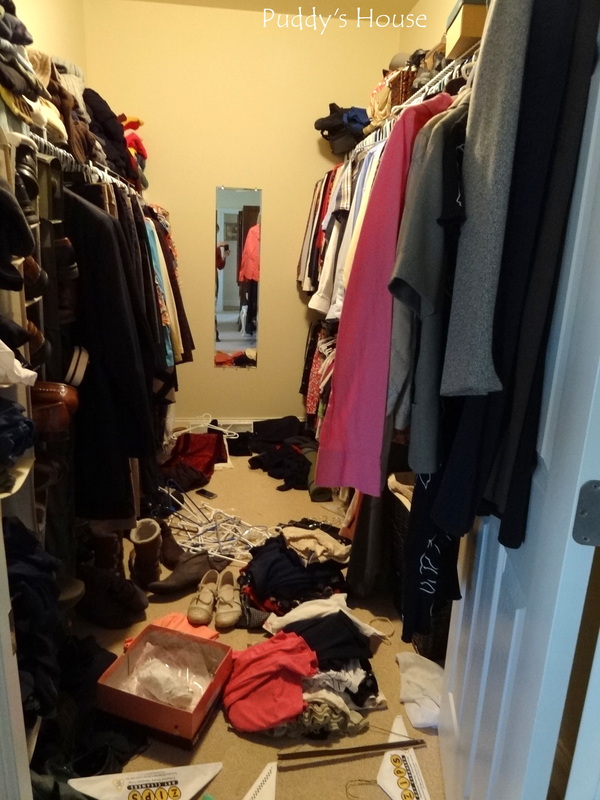 Oh, my closet and jewelry area are currently a mess and driving me nuts! Maybe this will inspire me to get purging/organizing. You did a great job.